One of my all time favorite foods is Tro-Menphen ( or Thenthuk Ngopa). It is a Silingwa dish – popular amongst the Tibetan farming communities based around the Siling region, since it takes few ingredients and its easy to make. The dish s not so well know amongst the exile Tibetan community except in the Amdowa circles – especially those from Kumbum/Siling area, but in Tibet these days, my friends tell me that most restaurants carry some form of this dish and its quite popular – known usually as Tro-Menphen or as Tso-Menphen. 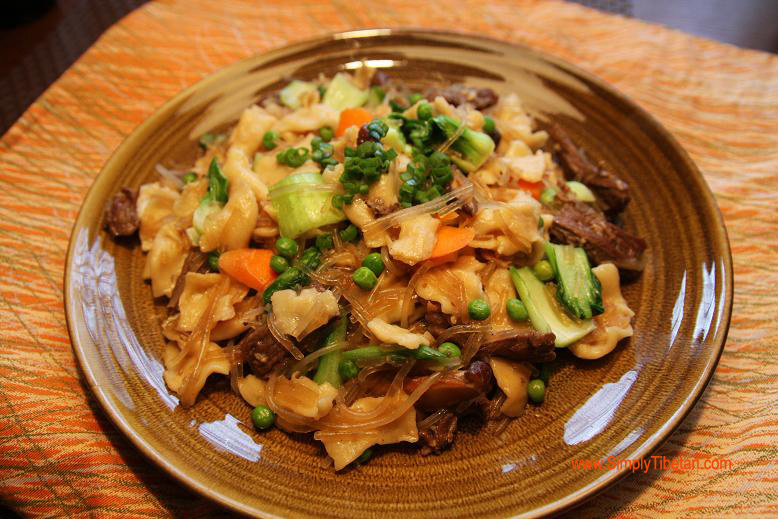 This is a pasta dish – the pasta is the same as in the popular Tibetan Thenthuk., but instead of being in soup, it is stir fried with sha (meat) and phing (beanthread). 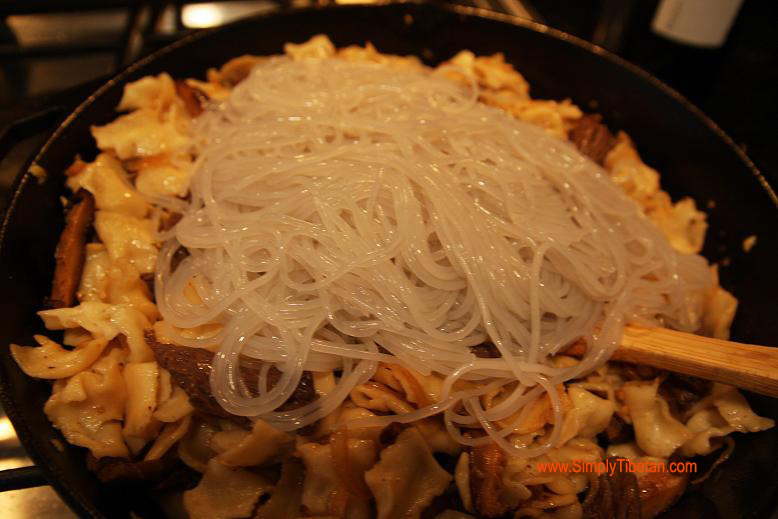 (if you are vegetarian, add some sha-mong (mushroom) instead of sha). But what I love about the dish is the texture of the pasta – it always cooks perfectly ‘al dente’ with little extra effort. And the unique combination of the slightly chewy texture of the thenthuk pasta, the smoothness of the phing (beanthread), the crunchiness of the peas and veggies, the firm-earthy flavor of the shitake mushrooms – all add up to make this a wonderful satisfying dish. Tro-Menphen nyae-po nang-go ! Please enjoy ! Prepare the dough as you would regular thenthuk. – the egg is option. It firms up the pasta – so for those who prefer a firmer pasta this is good. Knead well and then flatten it into oval shape and slice it into strips about 1” wide. Take a little oil on your palm and roll each strip so that they don’t stick together. Let it sit covered until you are ready to throw the pasta. Heat up some water – soak your bean thread noodles and you shitake mushrooms in hot water. (this can be done ahead of time – and kept in the fridge once the water cools). If using frozen peas, then let them defrost. If fresh peas, then par-boil them. Marinate your beef with some soya sauce, garlic-ginger paste, salt, pepper, erma. 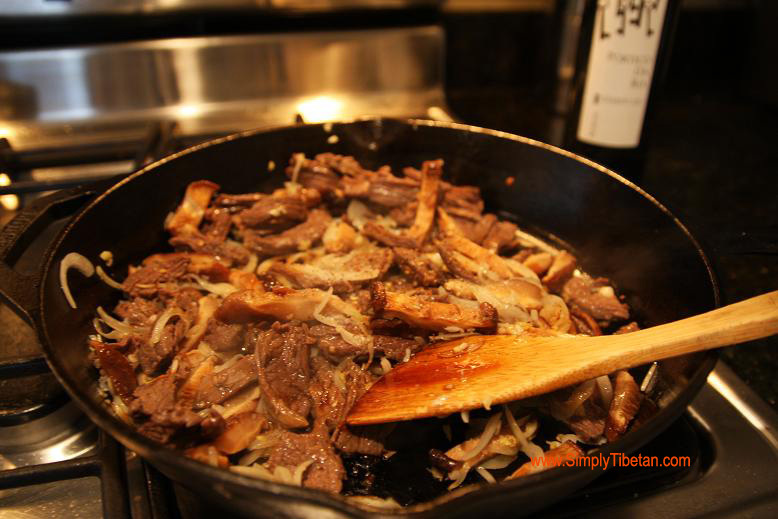 Add a tablespoon of oil to a heated pan, and stir fry the slice beef until done. 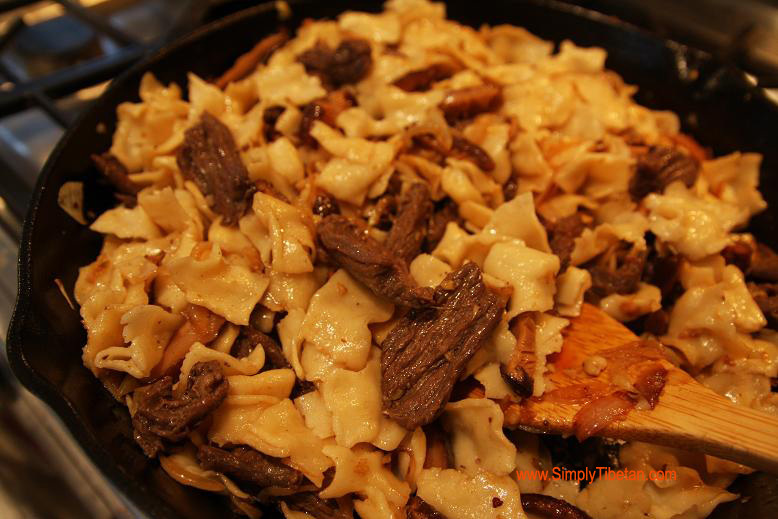 Depending on the cut of beef, you may have to add a little water and cook a little longer to soften the meat. After cooking set aside. Prepare shitake mushrooms that you have already soaked in hot water – cut of the stalk at the base and then slice them up. 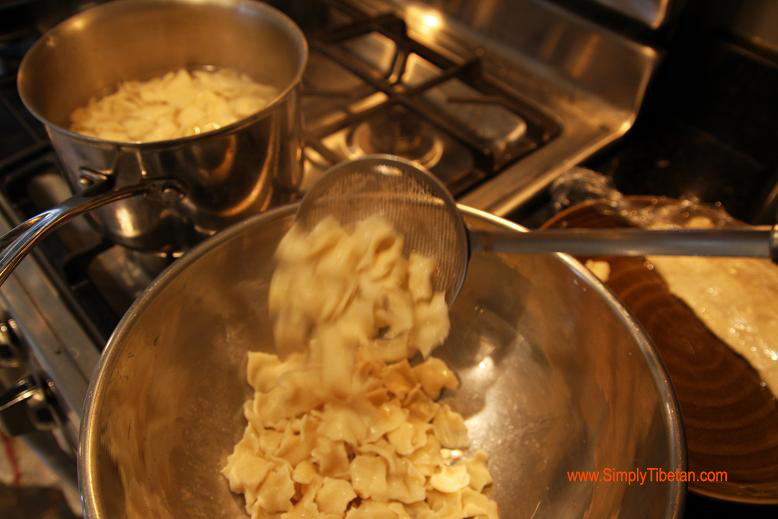 Now, its time to prepare the pasta – thenthuk. Heat water in a pot. (So, instead of soup, you are making the dough in plain water here). Take one of the strips of oiled dough, flatten it out with your fingers and gently pull it till is nice and flat like a long ribbon. Then, starting from one end, break of square thumb size pieces from the end and throw it one by one into the hot boiling water. Keep repeating – the trick here is to keep your hands slightly oiled and do not let the steam get to your hand – so literally you have to throw the pasta into the boiling water. (Alternatively if this sounds too hard, I guess you could roll out the dough flat and thin, and then slice a knife through it to shape your pasta – then throw the pieces into hot water.) You can tell the pasta is cooked as it rises to the top. Scoop out and then make some more. I used a small pot so it took me a couple of batches. 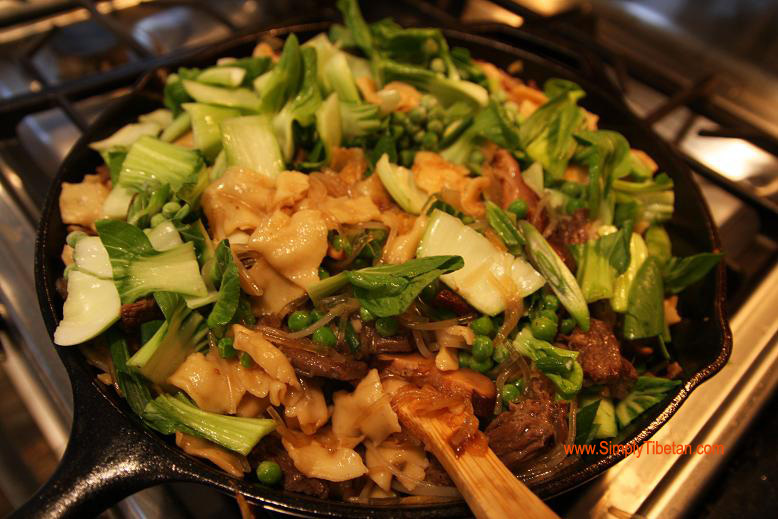 Heat up a nice big wok or big non-stick pan. 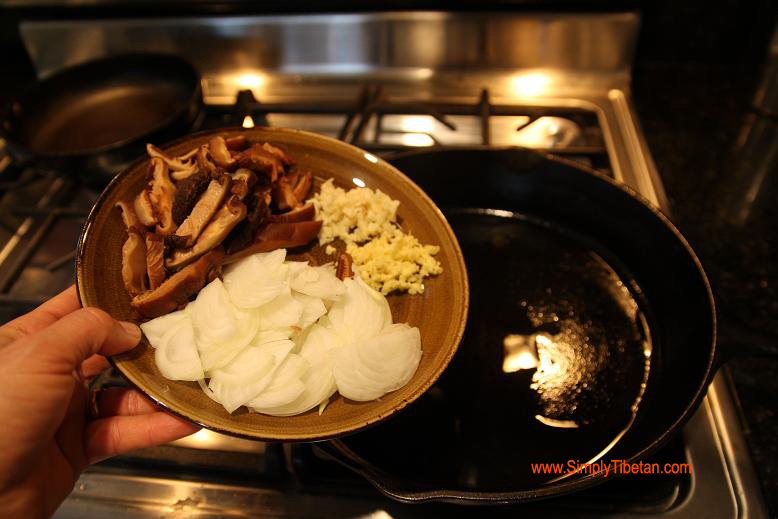 Add about two table spoons of oil – add your chopped onion, garlic, ginger – fry until golden. Add your sliced shitake mushroom, and the beef. Dash of soya sauce and salt to taste. Stir and let cook a little. 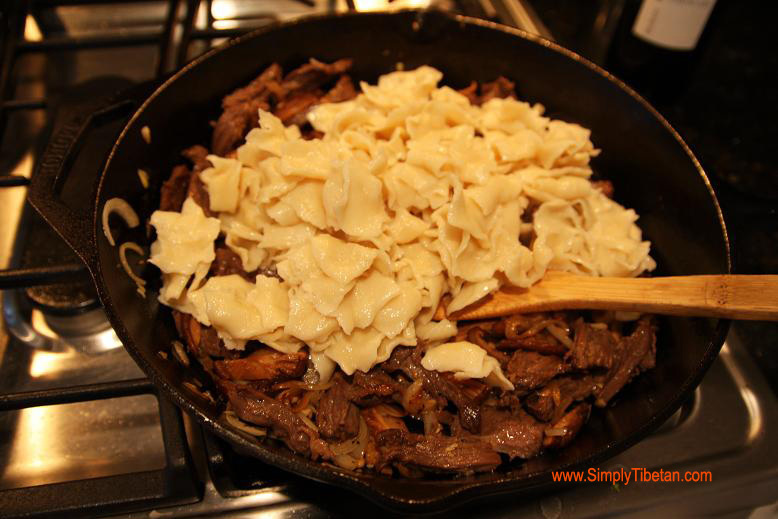 Add the thenthuk (pasta), a dash of soya sauce and salt to taste – let cook a little until evenly distributed. Add the Bean Thread, peas and leaf vegetable – keep stirring until both are cooked. Again, add a dash of soya sauce and salt to taste to flavor the bean thread. Garnish with some chopped spring onion and your dish is ready to serve! Erma is Schezwan pepper corn. Its red color and you can find in Asain store. A short explanation is posted here …. Hello! I tried googling Erma but to no avail. Can you explain what it is? Cheers! It looks good n delicious. I will try it. Thank you. I’ve tried this, and it was very good! This sounds so good. It’s on my list of recipes to try soon. 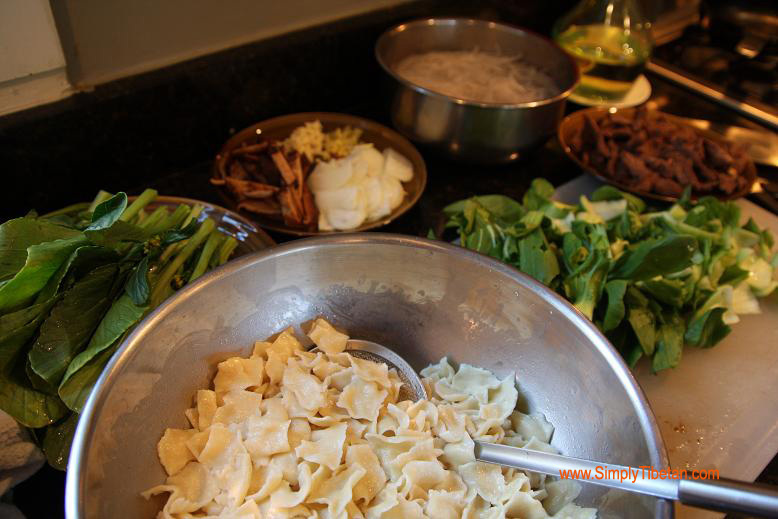 This entry was posted on April 13, 2013 by simplytibetan in Recipes and tagged pasta, pulled noodle, thenthuk, tibet, tibet food, tibetan, tibetan cooking, tibetan pasta, tibetan recipe.